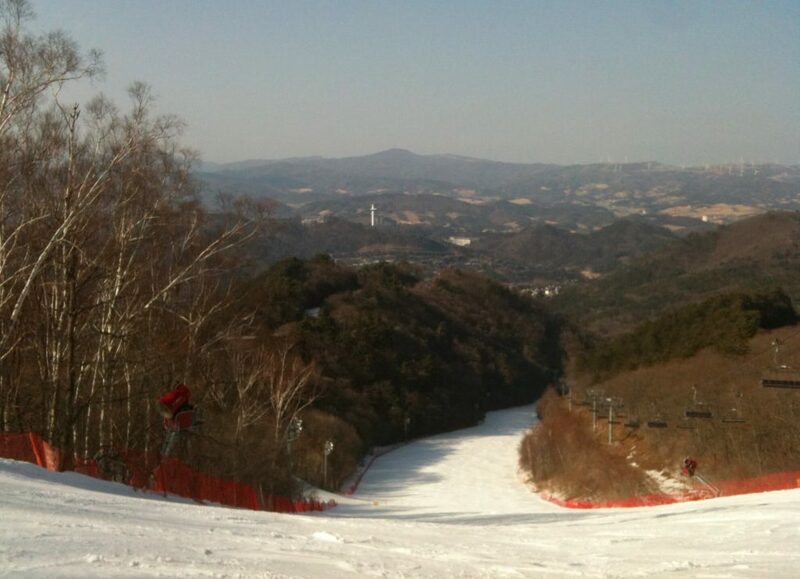 Yongpyong is a proper ski hill, with far better terrain than most Korean resorts. While still fairly small by European or North American standards, Yongpyong’s as big as it gets in Korea and has enough scope and variety for a satisfying day riding the groomers; they have a decent park too (but no pipe). Yongpyong also has one of the best snowfall records in the country, so it isn’t quite as reliant as most Korean hills are on snowmaking – that still isn’t saying much though! 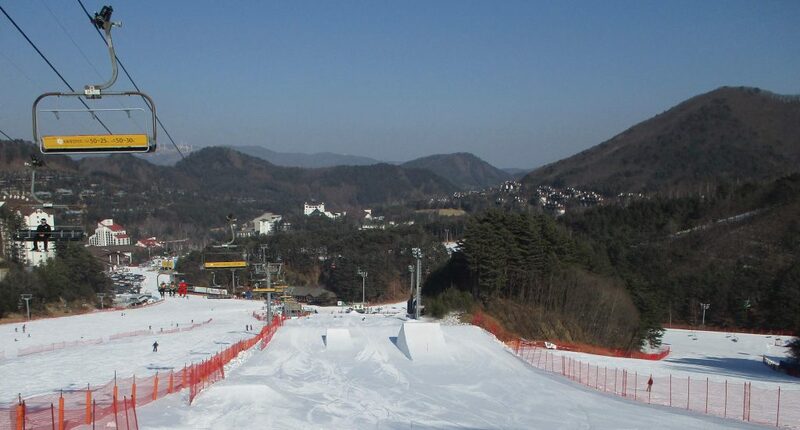 Yongpyong is basically split into two areas, with a low altitude area of easy and intermediate pistes around the base and a higher area of more challenging terrain including some genuinely steep runs where the Olympic technical (slalom) events took place. The two areas are connected by the gondola, with one long top-to-bottom run back down; I was expecting this run to be fairly tedious on a board, but actually the gradient is sufficient to keep decent speed up and it’s pretty good fun carving round the bends. Once you’ve gone up the gondola, the upper area has one chairlift serving the handful of runs up there; the lower area has a total of 12 chairlifts. The resort’s vertical drop of 640m applies to the top-to-bottom run from the gondola; the lower area alone has 340m max vert (from the ‘Gold’ chair), while the upper area (‘Rainbow’ chair) runs have 460m vert – well short of the 800m required for the Olympic Downhill, hence the need to build Jeongseon Alpine Centre. 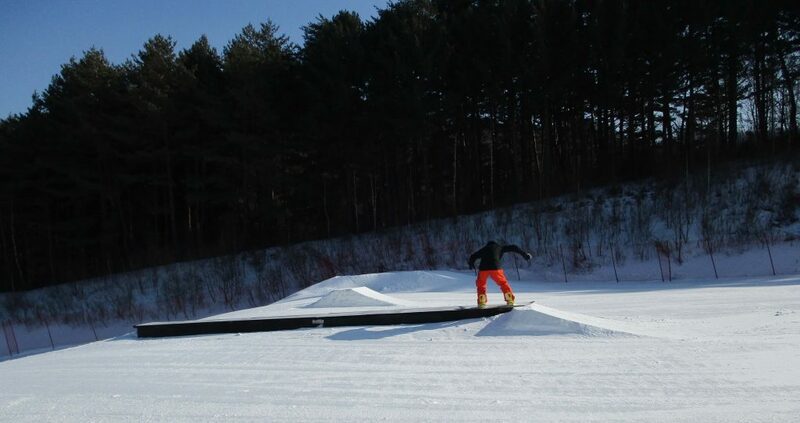 Freestyle; the park is one of the better efforts in Korea. 40% discount on lift tickets if you first buy a gift card (see here), then use it to buy your tickets. By the standards of Korean ski resorts, Yongpyong is as good as it gets and doesn’t have any particular negatives other than the lack of powder days and off-piste skiing – issues which apply to all resorts in Korea. Yongpyong follows the standard ticketing model in Korea, with the operating hours split into day & night by a 2-hour snow grooming break at 4:30pm; the slopes are open from 8:30am – 4:30pm, and 6:30pm – 2:30am. The daytime hours are subdivided into morning and afternoon, and the nighttime hours are subdivided into evening, night, and late night. You can get lift tickets for any of these individual slots, or for various combinations (details here) with prices ranging from 38,000 won for a late-night pass to 89,000 for afternoon & evening combined. Yongpyong sells gift cards which can be used throughout the resort to buy food etc, and can also be used to buy lift tickets with a 40% discount; this means you can buy the gift card first, then use it to buy your pass, and have enough left on the card to buy some food & drinks – who said there’s no such thing as a free lunch! Airbnb is also a good option in Korea – they have listings near Yongpyong/Alpensia (search for Daegwalnyeong-myeon, the local town) in addition to those in Seoul. If you haven’t used Airbnb before, you can get a 35-dollar discount off your first rental by signing up through Snow Guide Korea; simply click on this link and register! If you book a 1-day package (here) or 2D1N package (here) then your transportation is included. To travel there independently, the most convenient way is to use the direct shuttle buses from Seoul; these are privately operated and require advance reservation, take 2.5 hours, and cost around 20,000 won. You can book these here, and they can also arrange direct airport transfers. Alternatively, you can take public buses from Seoul’s Nambu Terminal or Dong Seoul Terminal to Hoenggye Bus Terminal (in Daegwallyeong), and a local bus or taxi from there (3 hours plus, all in). The private shuttles are way more convenient, and well-worth the extra 5 dollars or so. The Gangneung KTX bullet train opened in late 2017 and stops at Jinbu Station, about 90 minutes journey time from Seoul Station for 22,000 won. There’s a free shuttle bus from Jinbu to Alpensia & Yongpyong, see here; it’s only for guests of Yongpyong & Alpensia and you’re supposed to show a reservation receipt or Yongpyong Resort card to board, however when I rode it from Alpensia to Jinbu Station after skiing at Alpensia I could just board without showing anything. I was dressed in snowboard gear so had obviously been riding that day, and the Yongpyong front desk also said the shuttle was available to skiing-only guests as well as actual accommodation guests, so its not 100% clear really; I’m not sure how strictly they check reservations when going the other way from Jinbu to the resorts. If you can’t board the bus or don’t want to wait for it you can expect to pay about 20,000 won by taxi. Train tickets: you can easily buy KTX tickets on the day from the ticket counters & machines at railway stations, but trains do sell out (especially during peak hours & on holidays) so if you want to be sure of a seat on a specific train it’s better to book in advance. Again you can do this in person by visiting a station, or you can try booking online on the official Korail site; depending on your browser or your credit/bank card it may not work for you, in which case try Trip.com for a more international-friendly and generally more user-friendly experience (usually for a small markup e.g. markup on a Seoul-Pyeongchang ticket is just a dollar or so, but prices are sometimes actually lower on Trip). Any questions about Yongpyong? Leave a comment below and I’ll get back to you. Also check out the best Korean ski resorts according to various criteria, and this size comparison of Korea’s ski resorts using satellite imagery. Yongpyong is opening on November 17th! Are you planning to stay at the resort, or do a daytrip from Seoul? Hi, my mum and I will be traveling to seoul end of Feb 2018 and we are keen to stay 2 nights at alpensia. We do not ski but wanna chill and play snow. Would like to get you advice if it’s ok to stay at alpensia during this period. Hi, my family is planning for a daytrip to Alpensia on 22 Dec from Seoul. Since this is our first trip we want to bring our children to try out the ski. Is that possible? Are we able to get back to Seoul on the same day? What is the time of the last transport available? Appreciate you advice. Thank you. 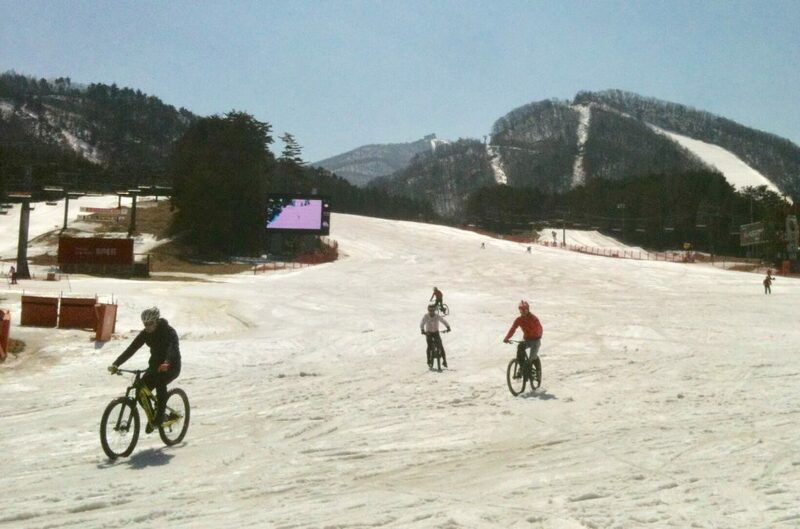 There is no skiing at Alpensia this season due to the Olympic Games, so you should go to Yongpyong Resort instead. And yes, you can easily go there & back in the same day, don’t worry about that. You can go there on the new KTX bullet train to Jinbu Station, then take the free shuttle bus from the station to the resort. I’m afraid we still don’t know the exact launch date for the KTX – only that it will be some time in December. Could be the 1st, could be the 30th… though it does seem more likely that they’ll get it done before the Xmas/New Year period, it can’t be guaranteed until the date’s confirmed. Given that December is only a week away it’s amazing they haven’t announced it yet! All very last-minute… hopefully we’ll know any day know, and I’ll update this page as soon as we do. Sorry I don’t have a more helpful answer for you at this stage! Are the hotel accommodations in Alpensia open between Dec 25 to Dec30 this year? Hi Fenn, the Rainbow & Silver areas are completely closed all season. Phoenix Park is closing in mid-Jan, so perhaps that’s what you read? Any updates on if there will be a shuttle bus linking Alpensia and Yongpyong? Thanks! Hi Alan, sorry, still trying to get answers from them! Hi Simon , my family of 6 will be in Alpensia booked At Holiday Inn and Suites for 3 days 2 nights. Are all establishment within vicinity are open although ski resort are closed? Which is better getting snowboard and gear rental in Alpensia or YongPyong? Thanks. Hi Meetz, so you’re staying at Alpensia and skiing at Yongpyong? In that case, it’s surely easier to rent your gear at Yongpyong so you don’t have to carry it from Alpensia! I’m also not sure if Alpensia will be renting equipment this season anyway. Let me know if you have any more questions, and have a great trip! Thanks for all your great info Simon! I’m planning on doing some snowboarding in Korea during the first week of January 2018. I had originally planned to go to Yongpyong/Alpensia but have recently found out about the closure. I was wondering as a beginner (I’m most likely going to need a refresher lesson or two), whether I should stick with Yongpyong (as it sounds like the beginner area is still open) or just go to High1 instead? 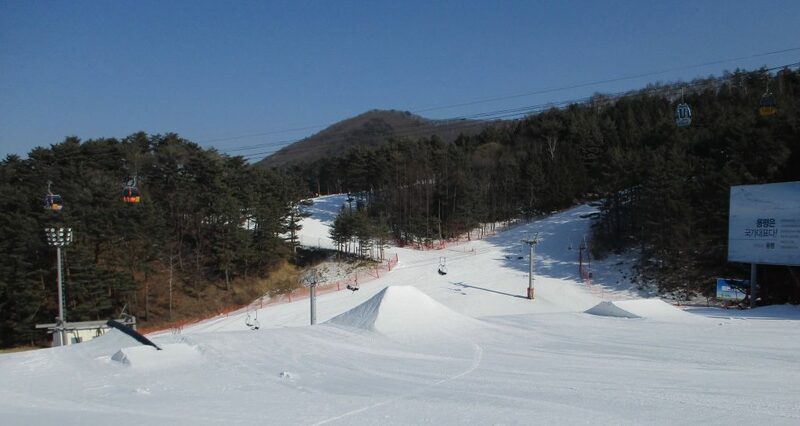 What are the beginner/intermediate slopes like at Yongpyong vs High1? Yongpyong and High1 are both good places to learn. But if you’re a beginner, the closures at Yongpyong won’t really affect you, and Yongpyong is easier to get to than High1. So actually I think you can just stick with Yongpyong to be honest! Do you know if Yongpyong has something similar to the 50% off for foreigners deal that High1 has? I was somewhat swayed towards High1 when I read about the 50% off from your High1 page, but if Yongpyong has something similar, is easier to get to and the slopes are similar for beginner/intermediate, then I might just stick with Yongpyong. Also do you know if Yongpyong offers lessons? Hi again Jia Lin, actually yes that’s a good point – the 50% discount at High1 makes it an attractive option. High1 and Yongpyong both have good ski schools with English-speaking instructors available, so you don’t need to worry about that. Hello, do you know how long the shuttle bus ride between KTX Jinbu Station to Yongpyong Alpine Center will be during Winter Olympics? Trying to figure out how early we should get on the train to catch the 10AM game. Thanks! I don’t know for sure how long the shuttles will take, but judging from the distance I’d estimate probably 25-30 minutes. Also remember to factor in enough time for finding your way through Jinbu Station, and the possibility of having to line up for the shuttle bus. I think at an absolute minimum I’d aim to arrive at Jinbu Station at least 1 hour before the event, or 90 minutes to be safe. As I said, I can’t give a concrete answer, this is just my best guess. Let me know if you have any other questions! Your website has been a great help with Olympic planning–better than the official Olympic site. Related to last post about shuttle time between KTX Jinbu and Yongpyong, is the distance to Alpensia (biathlon) about the same? I’m not too worried about arrival, but rather making sure I get the train when I leave at 22:00. Thanks. Anyway, yes Alpensia & Yongpyong are a similar distance from Jinbu KTX, although Alpensia’s closer to the highway so the shuttles to events there will be a bit faster (20 mins perhaps, without heavy traffic). Let me know if you have any more questions, and hope you have a great trip! Hi, is the cable car to dragon peak closed during winter olympics? I’m planning to go there on 2nd February 2018. Thanks for your comprehensive sharing on this site. It’s really helpful, appreciate it! Anyway, I’ll be in Seoul on 4th Jan for 8 days, it’ll be my first winter trip coming from tropical country. Would you suggest me to head to ski resort (planned on YongPyong considering the ease of access) on weekend, or wait for weekday for less crowd; or it doesn’t matter? Besides, I’m also trying to find an all-in package for first-time ski lesson (including ski clothes, equipment, and the lift tickets) in YongPyong. Do you happen to have any contact / recommendation? I tried to contact the ski lessons PIC from YongPyong website, but it seems that they only offer the ski lesson while I’m still waiting for their reply too on the gear rental. It’s definitely more crowded at weekends, so if you have a free choice between weekday or weekend I’d personally got for a weekday. Yes, Yongpyong does have gear rental available, you can arrange it when you arrive there. Have a great trip and enjoy your first winter holiday! Thanks for the info on this site. Some questions, though. My family and I (all of us are low intermediate level) were planning to ski for 3 days in Alpensia right at the end of March (28-31). Firstly, will there be snow at this time of year, and also will there be any lifts/facilities open? I read they are closed in Alpensia for the Olympics, but even the Paralympics end on March 18 so was wondering if they will open after that? 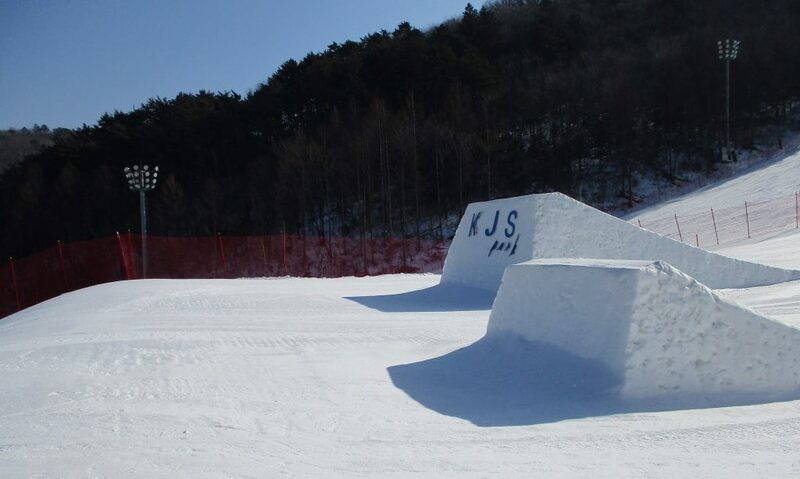 If not, are the slopes at YongPyong open that would suit us? And where would you recommend we stay for ski in/out? We had booked at the Holiday Inn in Alpensia but can cancel without penalty if need be. There’s no skiing whatsoever at Alpensia this season. If you stay at Alpensia, you’ll have to take the hourly shuttle bus to Yongpyong and ski there. 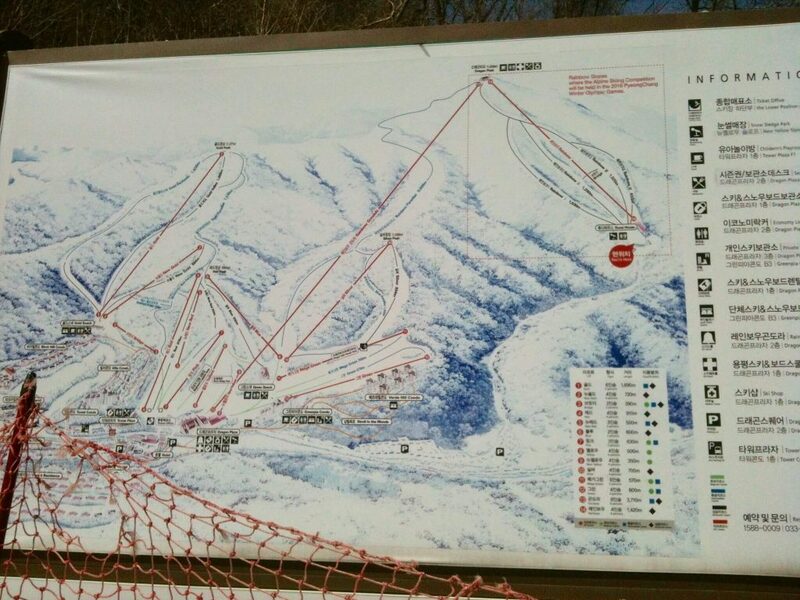 Yongpyong’s runs will still be open in late March except the Rainbow & Silver areas (but these are the more advanced slopes anyway). Looking at the open areas, Yellow & Red are good for low intermediates, and if you find those too easy you can try the Gold area. If you want to have accommodation near the slopes, then yes I’d advise cancelling Holiday Inn and instead booking one of these: Dragon Valley Hotel, Tower Condo, Villa Condo, Greenpia Condo. Those are the four in-resort options at Yongpyong. Many thanks for your help. I have switched our accommodation to Yongpyong as suggested and am hoping for snow still. Good stuff, hope you have a great trip! Hi Simon! Great info about snow sports in Korea! I have a question too. My sister is flying in from Canada to check out some Olympic sports. She’s a snowboarder herself, so I’m recommending that she spend some time on the slopes at Yongpyong while she’s here, just for fun. 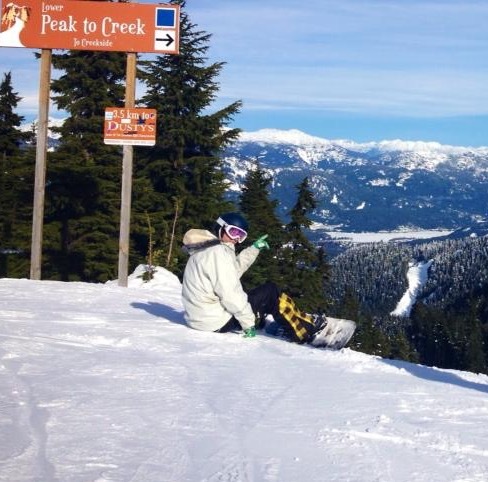 My question is: does she have to reserve a board and lift tickets in advance? She won’t be staying at the resort, so I’m wondering if she can just show up and do a half-day, or if we should get that sorted out for her in advance. There’s no need to book anything, she can just turn up and buy a lift pass & rent equipment on the day, no worries at all doing that! Awesome! 🙂 Thanks a bunch, Simon! Hi! We plan to go to Alpensia on the last week of March, will there still be snow on this time? And where is the best hotel to stay if travelling with kids. Thanks! Hi Len, yes there’ll still be snow on the ground in late March. Just remember that there’s no skiing at Alpensia this season, so you wouldn’t be able to do that… sledding may be available, though I’m not 100% sure. I think the Holiday Inn Alpensia would be a good choice, you can search & book their rooms here. Let me know if you have any more questions! Is the cross country run still available after the Olympic in Alpensia? It seems a good XC area in Asia. Is any other available in Korea?? I will be in Korea to watch my brother in the Paralympics in March 2018. I am confused on where I can ski. Will any of YongPyong Resort be open to the public? If not, which of the mountains close by are open to public for skiing? Hi Simon….your site is by far the most informative of any I’ve seen so far. So glad I stumbled on it. We are coming for the Paralympic Games and are staying at the Kensington Flora. Since the Olympics have been going for a week now, do you have any knowledge of whether we will have convenient shuttle service from the Kensington to the bus or train stations to go to the alpine site? The Paralympics are not using Alpensia, just Jeongseon Center I believe. Thanks again so much. Alpensia is actually a venue for the Paralympics – the cross-country & biathlon events will be held there, as well as the opening & closing ceremonies at the stadium. 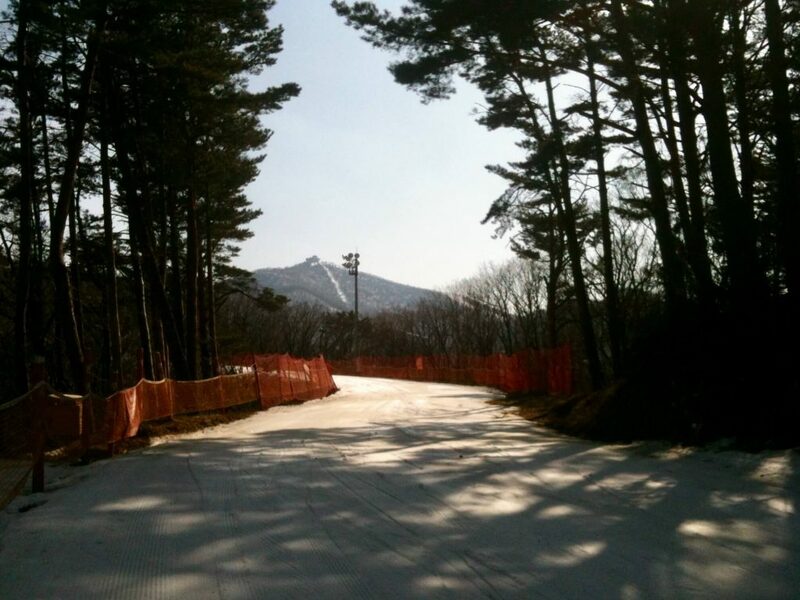 Jeongseon has the skiing & snowboarding. The Kensington Flora looks to be about 5 miles from Jinbu Station. I don’t know if the hotel has any kind of bus connection to the station, or if you’ll require taxis. But from Jinbu Station, you’ll be able to take the free shuttles to Jeongseon and Alpensia. I actually enquired about the Paralympics shuttles at Jinbu Station yesterday, and was told that they would be running, but the schedule hasn’t been determined yet. I’ll post the info once it’s available. Hi, Yongpyong usually opens in mid-November, so by the 2nd week of December they should have all the runs open. In terms of snow conditions, the snow is mostly artificial so the conditions are pretty consistent throughout most of the season. Hi Simon! Thanks for this very informative post! My friends and I are planning to visit the Yongpyong Ski Resort on March 25-26, 2018, will it still be open and will we be able to ski? 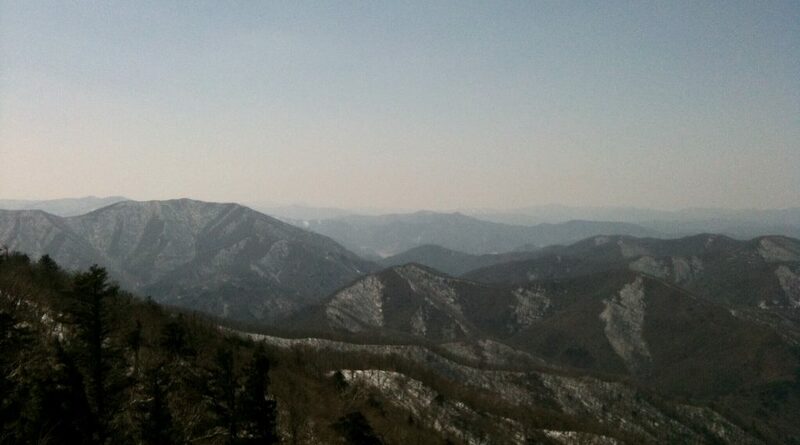 And do you happen to know how we can get to Odaesan National Park from the ski resort? What’s the best mode of transportation in that area? Thank you so much! Hi Jade, I’ve only ever used it for lift tickets (which includes the gondola) & food. I’m fairly certain you can also use it for ski wear rental & sledding though… basically you buy the gift card first, then use it to pay for everything to get the discount. Heading there this coming December with my wife & 2 years old son. I was wondering how much does it cost to book a taxi for whole day (8 hours) so that he can drive us around to nearby attraction like Woljeongsa, Mount Odaesan, Daegwallyeong, Seonjalyeong. I’m afraid I don’t really know the answer to this – I guess you’d want to negotiate a fixed price direct with the driver. Maybe if you work out roughly what the total cost would be if you were to do them all as separate journeys on the meter, you can use that to give you an idea what you’re negotiating down from. If you download the app called KakaoMap (it’s Korean but has English version), you can use it to search directions by car from A to B and it gives you the estimated taxi fare. Total all the journeys up, and then you have a rough idea what a fair price might be. Sorry I don’t have a better answer, but hope this helps. i am going korea 18-28 nov, would there be any ski resort that offers sledding for kid abt 5yo? Is Alpensia open for ski & sledding on 2nd week of December 2018? Is that safe for driving from Seoul to there? My family and I are planning to go to Pyongchang this November, tentatively 20th – 22nd of November. I am undecided on which ski resort we should go to. None of us knows how to ski, the main reason is just to entertain my 6 yrs old son who so eagerly wanna experience “winter” but unfortunately our Seoul trip is in autumn. Can u suggest which one is a better resort for us just to enjoy a scenic landscape of winter. Thanks! We plan to go to YongPyong Resort on the last week of March 2019 which is next year. Will there still be snow on that period? Are we still be able to ski? None of us know how to ski. They usually close in late March, so I’m afraid you might be too late. For the best chance of catching them while they’re still open, you should plan to go on your first day in Korea! And then when the time gets closer, you can check on their website (or just ask me) to see if they’re going to be open when you come. Do we need to pay to enter the skiing area to ski? Hi Johnny, you just need to get your lift tickets, there’s no separate entry fee. Hi there, i’m planning to do a day trip for ski during 15th – 21st Nov 2018. Would you recommend YongPyong Resort for first-timer? Or any other ski resort you would recommend? Thank you. 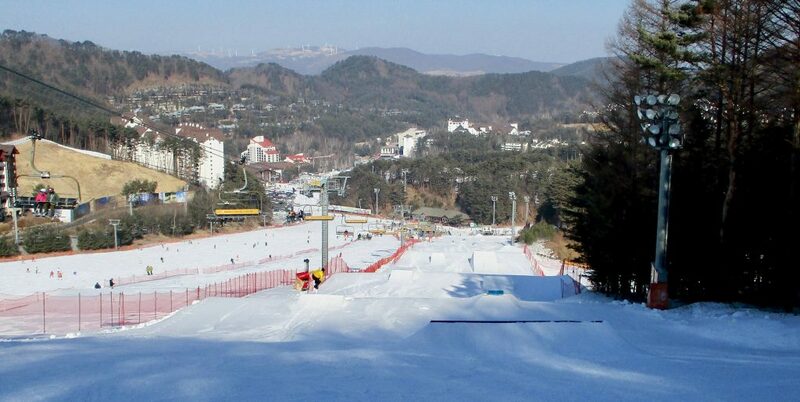 I’m planning to go to Yongpyong ski resort in October. Just wondering, is the direct shuttle bus from Seoul operates in October? I found that it only operates in November to March? I’m planning to go on the mountain coaster & on the gondola ride to the dragon’s peak. Any tips? Yeah the ski season doesn’t start until November, so the transportation options are more limited before then. I’m also not sure if there’ll be any shuttle bus from the KTX station in October either, so to be honest I think your best option would be the public highway bus from Nambu Terminal to Hoenggye, then jump in a taxi (10 minutes) up to Yongpyong. Took sometime to read your site about skiing, I’m going late FEB ’19, was shortlisting this 3 resorts, YongPyong, High1 and Welli Hilli. I’m going as a group, say 4~6pax, mostly low intermediate skiier/snowboarder. Which resort would you recommend for us? In my mind I was thinking about High1, but just the travelling itself will take us 4hours up =/ I will be spending 1 night there, probably doing 3 session, NOON/PM/AM. Ideally wide skiing terrain and softer snow, and ofcourse lesser crowd! Thanks for your input. I’d only recommend Welli Hilli above the other 2 if you’re keen to ride freestyle & halfpipe, but that doesn’t sound like what you’re looking for so that should narrow it down to High1 or Yongpyong. In terms of terrain & snow quality they’re fairly even, so the main differences are that Yongpyong’s easier to get to, but High1’s a more modern resort so the accommodation & facilities are better. So maybe consider those points and make your decision according to which is more important for you. Hope this helps and let me know if you have any further questions. Cheers! We are visiting Seoul in the around mid-October to mid-November and planning a trip to some ski resort. We want our 5 year old daughter to have a good winter experience as none of us know, how to ski. Can you please suggest the best place and the time in November to visit Yongpyong-alpensia? October’s too early, you’ll need to go at the end of your trip as the resorts usually open in mid-November. Even then, if it’s a warm autumn you may find that the ski slopes aren’t open until the last week of November, it’s impossible to predict at this point. But anyway you can still go and stay there, and even if the ski slopes aren’t open yet you should still be able to see and experience snow on the ground. Yongpyong ski area usually opens slightly earlier than Alpensia, but Alpensia is a nicer resort for a non-skier family stay as it’s a much newer & more modern resort. Hi. I will be going to yongpyong on 13/11-14/11. I just want to know, if there any snow on that time? Its ok if the ski is still now open yet, but what about on the ground? Is it snow? Hi Zahra, I’m not sure. It’s unlikely you’ll see any snow on the ground around the resort, but there’s probably a decent chance you’ll see snow on the ski runs (they start making snow as soon as it’s cold enough), and if you ride up the gondola you might be able to walk around on snow at the top of the mountain. When does the snow fall in Yongpyong and is it good in December? we are planning a family trip from the 20th December for 10 days. Where is the best place to stay for families ? and whats the best avenue to buy lift passes, can you buy several days at a time? Hi Rupert, yes if you go on December 20th it’ll be in full swing. Natural snowfall isn’t great, but most of what does fall comes in December & January, and they make snow from early November onwards. Advise booking accommodation asap as you’re planning to go over the Christmas & NY period and it’ll be busy. If you want a hotel, Dragon Valley’s the only option at the resort itself; if you’re happy to rent a condo they have a few condo buildings there too. If none of that’s available you’ll have to try accommodation in the nearby town of Daegwallyeong. Not sure if you received the last reply? Is the Am hotel and Ramada near the slopes and if so is there transport everyday between the 2. I would like to book one of these asap. Do you know which is the better of the 2? Apologies for the delay, I don’t always have time to check messages every day, yesterday being one of those. So, I’ve had a look at each of those options. Am Hotel is well positioned in the middle of Daegwallyeong, so would be most convenient for arrival & departure. It’d be about 10 dollars (and 10 minutes) for a taxi from there to the slopes; the hotel may have a shuttle bus to Yongpyong, but I’m not sure about this. The Ramada’s a little bit out of the town proper, in a different direction to Yongpyong. I’m pretty sure they’ll have shuttles to & from the town centre, but again I’m not sure whether those would also be available to Yongpyong. Yongpyong itself may have a shuttle bus running from the bullet train station (20 minutes out of town), which would presumably stop in Daegwallyeong on the way through – but they haven’t announced their transportation plans for the season, and I don’t expect them to do so any time before November. Sorry, things are often a bit last-minute in Korea! The bullet train only opened earlier this year and the Olympics were obviously disrupting normal operations at the time, so we’re not yet sure what the new normal will be. The pension you mentioned is in the same direction as Yongpyong, but a few km further out. I would imagine they’d be able to drop you off & pick you up from the resort, but again I don’t know this for sure. There’d be basically nothing to do there in the evenings though – on that front, Am Hotel definitely looks the best spot due to being right in town. It’s not exactly a lively town (don’t expect anything like Whistler or Verbier!) but there are a decent number of restaurants, cafes and bars dotted about. The Ramada’s obviously a large resort with plenty of on-site facilities, but you’d need to use buses or taxis to go back & forth if you wanted to mix it up & eat in town. Thanks for the in depth replies and information, very helpful and very much appreciated. Cheers Rupert, glad to help. Hope you have a great trip to Korea! Thanks for the swift reply and information, is the Am hotel, Ramada Sanbang and Rodem tree pension close to where we want to be? if so how far and how do I get to the slopes everyday and what is there for things to do for families in the evenings? Any recommendations would be greatly appreciated. 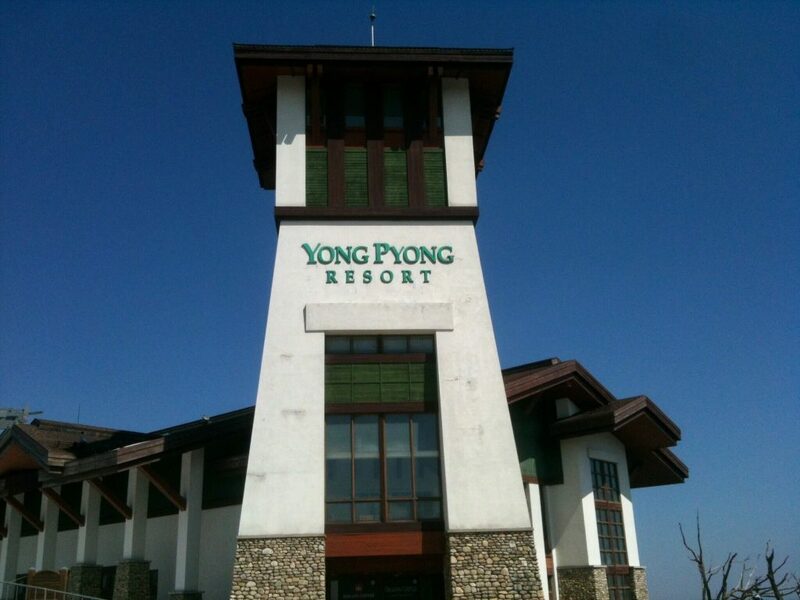 We are going to stay at the Yongpyong resort from 12-14 Dec. Is Greenpia condo a good choice? We need to catch a flight to Jeju on 14 Dec at 3.35pm, do you think there will be any issue if we take the 9.10am shuttle bus from Yongpyong to Gimpo Airport? I’ve never actually stayed at any of Yongpyong’s accommodation, but yes I think Greenpia is a good choice. The 9.10 shuttle should be perfect for your flight from Gimpo, it should get you there a couple of hours before the flight so plenty of time to check in and have lunch. Give me a shout if you have any more questions, and I hope you have a great trip! IT IS POSSIBLE YONG PYANG OPEN ON 21 NOVEMBER THIS YEAR? Yongpyong usually opens around that date, so it may be possible but the official opening date hasn’t been announced yet. I’m wondering if there has been any update regarding shuttles to and from Jinbu to Yongpyong/Alpensia and between those two resorts? I’m booked to get to Alpensia on 26 December 2018 and now realise that it might have been a silly idea to go at such a peak period! Hi, sorry we’re still waiting for them to announce their transportation plans for the season. But the peak period is the most likely time for them to run a shuttle bus, so as long as you already have your accommodation booked it isn’t a silly idea! If there’s no shuttle you can take a taxi for around 20 dollars, or alternatively just take a direct bus from Seoul to Alpensia. Keep checking back – I’ll update this page with the information as soon as it comes out! We (2 adults and 18-year old daughter) plan to ski at YongPyong ski fields from Dec 4 – 8, 2018 and would like to stay in a hotel/condo facing the ski slopes. Unfortunately, the family or large rooms are fully booked out. Hi Richard, for a definite answer please ask them directly. But as far as I know, they do allow 3 people to share a twin room but will charge for an extra bed. hi we will be staying in yongpyong this nov 21-22. is it skii season already? will there be snow enough to skii? thanks for the reply! :D but i think i saw somewhere that they’ll be opening on nov17 but im not sure if that was legit. do you have a reliable website for any skii news in yongpyong? The weekend of November 17th would be my best guess, I think that’s probably the date they’re aiming for. But they can’t announce it yet until they know they’ll have enough snow ready, which depends on the temperature over the coming weeks. They told me the opening date will be announced at the start of November, at which point I’ll post an update here. Hi! May I know if they are open for ski 20-21 Nov? Could you please tell me are there any good shops locally that I can purchase snow gear for the children? Is it getting cold yet? There are shops in Daegwallyeong, but I’ve never visited them so can’t make any recommendations I’m afraid. If you have time, there’s a whole bunch of ski shops in Seoul concentrated in the Hakdong area in Gangnam (along the main road between Eonju & Hakdong stations). We just want to visit the ski resort. But not gonna do some skiing. Is this allow? I’m planning to go to Yongpyong on 15 December 2018. I will drive a car from seoul. Do I need to standby car snow chain? Natural snowfall in the area is light, so the roads are usually clear. To be honest I’ve never driven in Korea and I’m not sure if there’s any legal requirement to carry chains. I wouldn’t expect so, but if you’re renting a car it’d be better to ask the rental company. Hi Simon, first I’d like to say thank you for the super informative site. Incredibly helpful for anyone looking to visit a skiresort in South Korea. – does it go direct to Incheon aiport or stop in Gimpo airport/Seoul first? Trying to figure out if I can ski for most of the day and then board the 16:00 shuttle bus and be at the Incheon airport before 20:00. Been stuck in bad Seoul evening traffic before so know that it can take a while. Thanks, glad you’ve found it useful! So, it’s a pretty tight call. For a 10pm flight I probably wouldn’t risk it, for a midnight flight it should be fine, for something in between I can only say your call! If you do decide to go for it, I always use Trazy for booking ski buses and find them to be good & efficient, it’d be awesome if you could book using this link. Cheers! 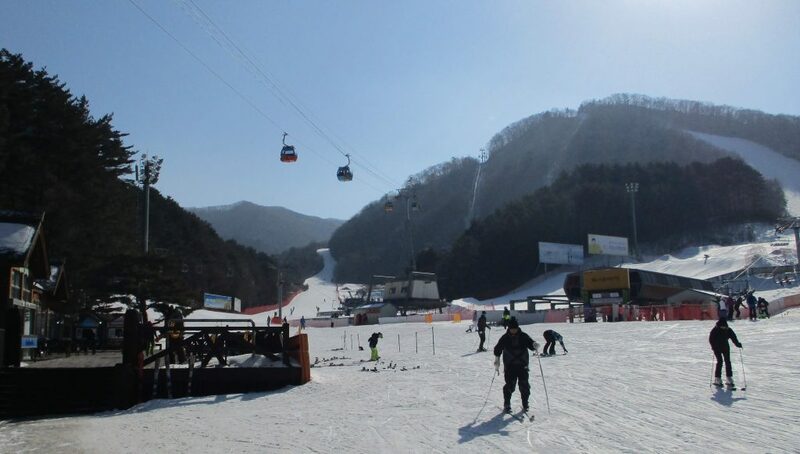 Hello, I just booked yongpyong ski resort for 1 night on 25feb. Still within ski season and probably off peak. Am I right? Hi Bob, yes that’s right. Enjoy! Hi, we’re going to Alpensia on 9 December 2018. Will the ski & sledding facilities be opened by then? Hi Simon, thank you for the very informative site and helpful responses! Would you happen to know if it will be easy to get a taxi from the resort to Jinbu (where the trout festival is) and an estimated cost of the fare? Also, any way to buy the gift card in advance and use it to book the ski lessons and ski pass since that’s up to 40% off? Hi Derick, a taxi should take about 25 minutes, and cost 20 to 30 dollars. Ask the hotel staff to book one for you. Alternatively you could take the resort shuttle bus to Jinbu KTX station, then from there it’d be maybe a 20-minute walk or a quick taxi ride. You don’t need to pre-book ski passes & lessons, so when you arrive you can just get the gift card first and then use it to pay for them. Thanks a lot for the helpful advice! hey simon , I’m getting a little worried about the snow fall for my ski trip in yongpyong on the 12~ 15 december. i have checked the cams on yongpyong resort and some of the hills such as gold slope and rainbow slope does not have much snow on them. so may i ask by the 12 december will all slopes be fully covered in snow and all of the slopes ready for ski ? or will some slopes be closed. Thanks ! It’s impossible to say at this point as it depends on the weather between now & then. As long as temperatures remain nice & cold they can keep making snow, and hopefully there’ll be some good natural snow dumps too; they’re usually fully up & running by that time though, so even though it’s been a slightly late start this season I don’t think you need to worry too much unless it suddenly gets warmer again (it’s forecast to hit minus 10 Celsius overnight in Seoul next week, so that bodes well). thanks simon 🙂 ur really helpful i appreciate it . They have snow-making equipment, which they use whenever it’s cold enough. So yeah, if there’s no natural snow you can still ski thanks to the man-made snow. If there’s natural snowfall then they still top it up with man-made snow, so you’re usually skiing on a mix of the two. hey simon are all the slopes up by mid December ? The answer to that would usually be yes, but the weather really isn’t helping so far this season. Temperatures are looking good & cold from now on though so they’ll crank the snowmaking and hope for some natural snowfall. So that’s a maybe – if there’s a dump, it should all be open by mid-December; without snowfall, they might still be struggling with the Rainbow section at the top but the rest should be open. Just started skiing at the resort today. Currently only 3 lifts are operational, i.e. No. 5 New Red, No. 7 Pink and No. 8 Yellow ski lifts. It is not crowded. The runs are more suitable for beginners than intermediate skiers. There is no natural snow, only man-made snow. The other runs are being gradually filled with man-made snow. Hopefully they will open more runs within the next few days as the weather gets colder. This morning (6 Dec.) it snowed and we had a bit of powder to ski. By noon, the snow was sluggish. Only the usual 3 ski lifts were operating. Hopefully it will snow again tonight. It actually snowed a little in Seoul last night, but just a few flurries. Gave me hope for the mountains though. Thanks again for the updates, fingers crossed for a proper dump! Today (7 Dec) is my last day at the resort. So this is my last update. It was very cold (-11 C) and windy. They opened another “Blue Run” near the Villa Condo and No. 9 New Yellow ski lift. With the very cold environment and man-made snow, good chance of more runs and ski lifts opening next week. It was more crowded with many school students. Buy the “Gift Card” in denominations of 50K, 100K, 300K or 500K Won at the Hotel reception that will enable discounts of 5% at the bakery opposite the reception, 40% ski lift & ski gear rental and 30% for the gondola ride. Not sure about others. Can buy any number of “Gift Cards”, it cannot be top up unlike T-money, just buy more cards. Any residue amount (after using more than 60%) can be refunded at the Hotel reception (no admin. charges). All the outlets that I patronized accepts the “Gift Card” including the food kiosks, cafe or restaurants, so no problems using the Gift Card. May I ask if you do not stay at the resort, are you allow to buy the gift card? Hello. Would you give me a good recommendation on managing an itinery in Pyeongchang? On my planning, in 10-12 Jan’ 2019, I want to go to Pyeongchang Phoenix Park, Jeongsan High1 Ski Resort, Yongpyong resort, and Daemyung vivaldi park ski world. Will it be enough time and worth it enough? Thankyou! Hi Grace, that’s too much for 3 days. I’d omit Vivaldi Park and do 2 or 3 of the others. How will you be travelling, by car or by public transport? public transport. will it be hard to accomodating there? Ok, so I’d probably stick to 2 of them. Either stay at Yongpyong both nights with a day-trip to Phoenix Park or High1, or stay 1 night at High1 & 1 night at Yongpyong. Are you starting & finishing from Seoul? Or direct to/from the airport? Yes I’m starting and finishin from Seoul. Is it far enough from Phoenix Park to High1? Because I already booked near the Phoenix. I am also doing a few days at Phoenix and then intending to do a couple more days at Yongpyong, is taxi the best way to get there and is it expensive? Or is it still possible to catch a shuttle to Pyeongchang station and KTX to Jinbu station and shuttle to Yongpyong? Thanks for the update Beyan, glad to hear you had a good trip! Hello. We will be staying at Alpensia. Little ones will ski at Alpensia and will expect the more experienced bunch to head to Yongpyong. Is it advisable to rent gear at Alpensia or YP? If they rent at YP it’s possible to keep it there? Also, there seems to be less options for group ski lessons. Any suggestions for 9yo intermediate skiiers? Thanks! Thanks, Simon! Do you also know how strict Alpensia/YP are with little kids e.g. 6yo doing private or group lessons with instructors? The ski schools have mentioned adults need to accompany young kids. And I wasn’t expecting this as of course I was hoping to get some skiing done too! Thanks for all the comments u have given. I will be @ YongPyong in mid March 2019. Regarding the cable car, it shows in the webpage its only in operation from 4th Dec – 2nd March. Do you think thats true? I was thinking to get the gift card. If I do not ski there, what would you recommend me to do in mid March for 8 of us for sightseeing? The ski season ends in March, the exact date depends on the temperatures and how much snow they have left. So, Sat March 2nd is the latest date they can presently guarantee to be open, however it’s possible they could continue to the 9th or 16th if conditions allow. If you can’t go skiing, other ideas could be to visit the Daegwallyeong Sheep Farm, or go hiking in Odaesan national park. I just finished my skiing today on the 27th December 2018. It was really wonderful as it is my first virgin ski. Took a taxi from Hoenggye to Yongpyong as it is much more convenient. There are quite a number of taxi in the morning (Saw 5-6 taxi while I was having breakfast at Paris Baguette. Taxi cost at 10,000won. The local bus start operation at 10am and ends at around 2pm according to Yongpyong website. There is a free shuttle bus running from Hoenggye Post Office (Just beside Hoenggye Intercity Bus Stop). The timetable state that it starts as early as 5am and end as late as 11pm. If you can board this bus, this is the best and the cheapest option. If not, taxi is fine and convenient too! If you board the taxi, tell the driver to head to Dragon Plaza, here is where you buy tickets, rent ski equipment and storage. The ticketing counter is located outside the skiing area. If you are inside Dragon Plaza, find Gate 1 or 2 and head out, you should be able to see the ticketing office. Go to the ticketing counter and ask to purchase a gift card to pay for the ski lift and ski equipments. I ask for ski lift and ski equipments for 2. So this is the cost breakdown for anyone who are still confused. Grand Total = 166,700won for 2 ski lifts and equipment. Paid 200,000won for 2x 100,000won gift card. After deducting all the cost, I received a 100,000won gift card with left over value of 33,300won. Do a digital signing for the agreement of deduction and you are done. Now go rent ski jacket and pants, this is different from ski equipments. Went to a Ski Mart to rent, their shop signboard will state rental of ski jackets or something. Give it to the person and you get your ski equipments. For lockers, bring coins of 500won. I tried going the same shop that I rent ski jacket but the lady is reluctant to change for me but oh well, it’s okay, life goes on. Now locked all my stuff and go ski!!! The leftover value gift card (33,300won left), I used it to buy the 2x gondola ride. I would advise you go for this! The view is superb!! Cost of gondola ride is 36,000won for 2 person. There is a 30% discount. So it should cost around 25,000won. And you now left 8,100won. You can take gondola ride up to the peak, get a cup of their signature Mocha at 8,000won, sip and enjoy the sunset view. After the sky is dark, you can head to the tourist information counter to book a taxi, it’s super easy, write down your nationality and where you want to go in English on the paper they give you, the officer will call a cab and translate for you. You be given a paper with the Taxi license plate number and be told to wait at the lobby. Took around 7mins for taxi to arrive and ta da! Done for the trip! This is based on my experience today and should be taken as reference. There could be a better options then mine. Before this blog, I searched a couple of sites like TripAdvisor or tour sites trying to get information of Yongpyong ski but many of them are outdated or lack of information. Thanks Simon For all the tips! My apologies for my poor English! I hope you guys try skiing at Yongpyong! Good luck! Glad you had a good time at Yongpyong, and thanks for the detailed report! When is the snow season in Korea? I am planning to go in mid of March, are the skiing areas still open then? Most resorts are done by mid-March, the last to close are usually Yongpyong, High1, and Phoenix Park. Hopefully they’ll still be going when you’re here, but it’s too soon to say at this point – temperatures have been a little higher than usual and we’ve hardly had any natural snowfall so far, so unless things change it might turn out to be an early-finishing season. Check back in late February/early March, and fingers crossed for a decent dump or two before then! Snow biking is allowed there? You can rent a bike and ride the entire mountain? Hi, I don’t think they have rental bikes, those guys in the picture above presumably took their own bikes along with them. I’ve only seen it on that one occasion. I have no idea if they were allowed to ride the entire mountain or just that one piste, unfortunately I didn’t chat to them or think to ask. Looked like a lot of fun though! Hi Simon, could I check whether you think there will still be snow in the 1st week of March 2019 for this season? Yes they’ll still be open then, the snow will probably be quite patchy & slushy though. Hi, I will be coming from sokcho. Any idea how do we get to yongpyong from there? And how do we go to daegwallyeong sheep farm? Is there any other things to do near yongpyong? Thank you!